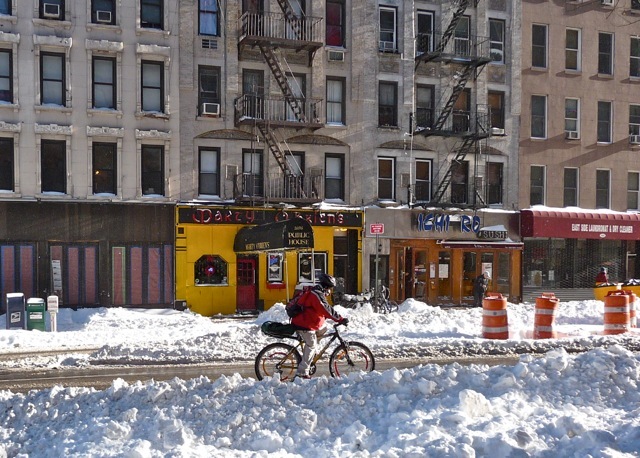 New York was hit by a snow blizzard yesterday, the day after Christmas day. 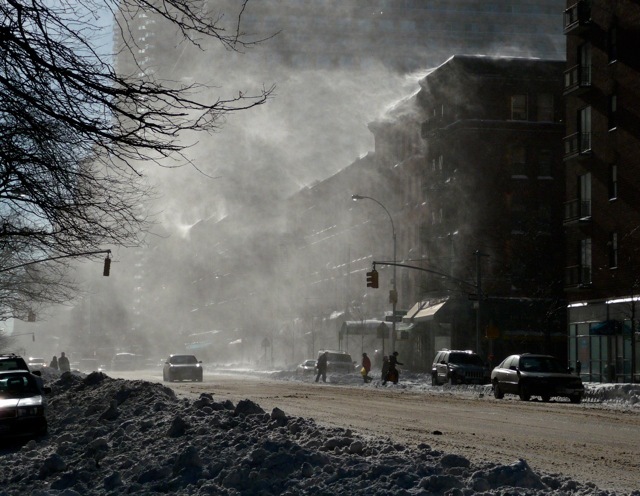 Eighteen inches of snow fell, and it is the 6th largest snow storm on record suffered by New York. 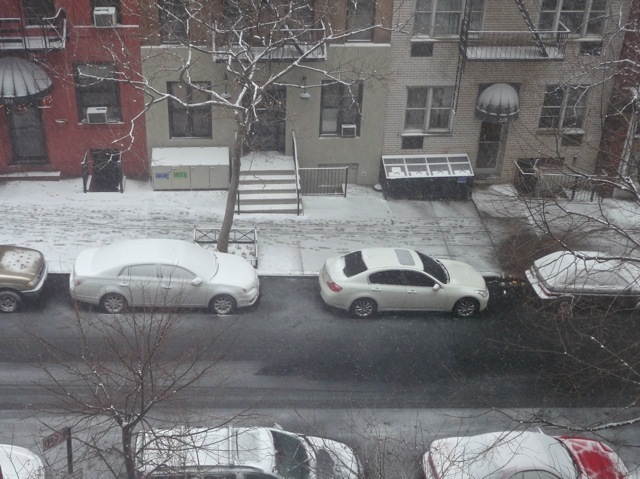 This is the first snow storm we experience since we moved back to New York in March. Yesterday afternoon, the snow began to fall. The street we live on began to be dusted with white powder. 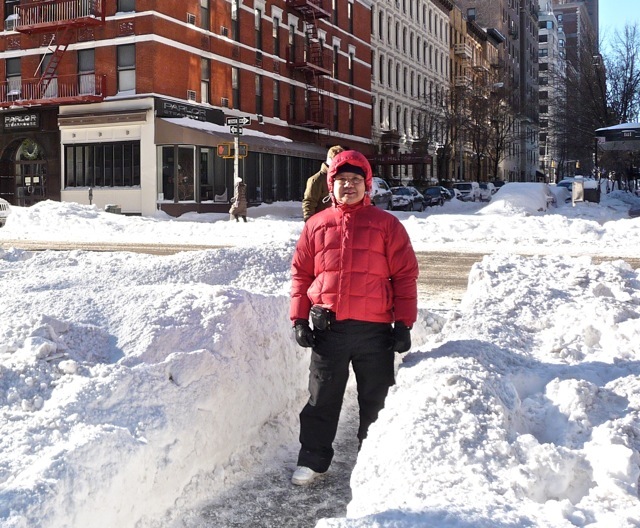 By this morning, the street was covered in a thick layer of snow. Since the snowfall was accompanied by 40 MPH winds, the accumulated snow was scattered into mounds and clearings. Even though the snow fall has stopped, the strong wind whipped up snow from roofs and created a secondary snow fall. 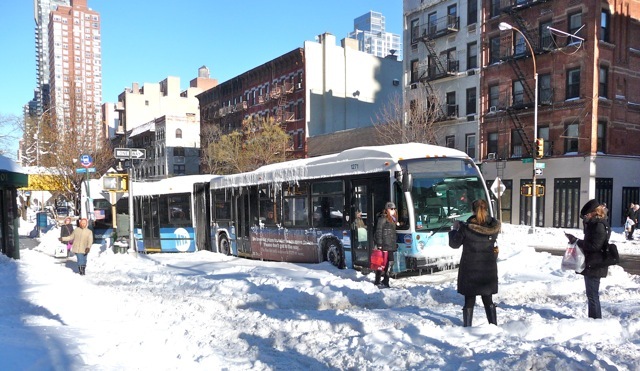 During the snow fall, this articulated bus jack-knifed and became mired in snow. Pedestrians took pictures with it as if it were a stranded whale. 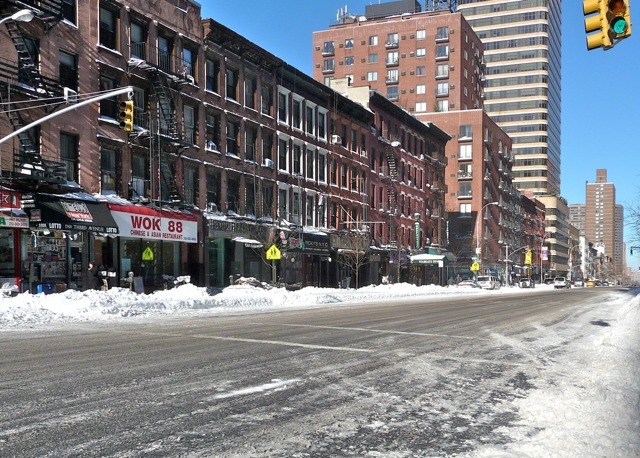 Main thoroughfares as this Third Avenue was plowed clear of snow. Traffic zipped through them freely. 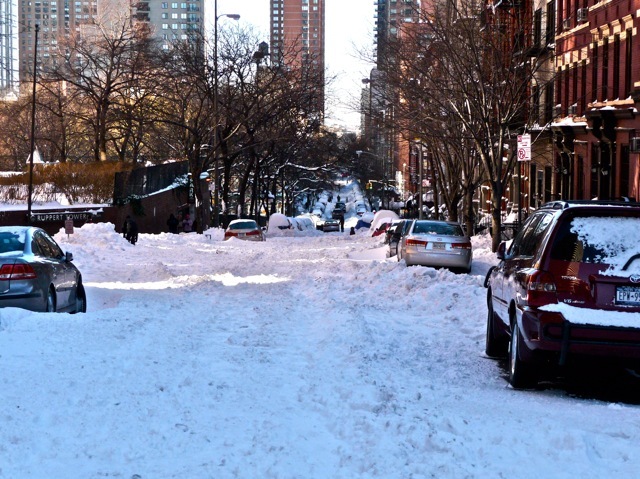 Side streets that were not plowed yet remained obstacles to cars and people. Dressed in ski pants, down jacket, sweater, cap and gloves, I was comfortable even in a windy (30 MPH) cold (30F) day. This man was fully equipped to go snow shoeing. 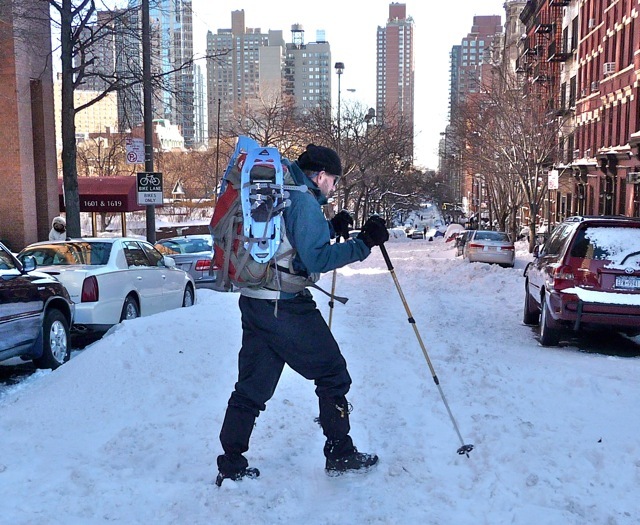 On un-shoveled sidewalks, he could simply put on his snow shoes and propel himself with his poles. Most dogs were warmly protected by booties. 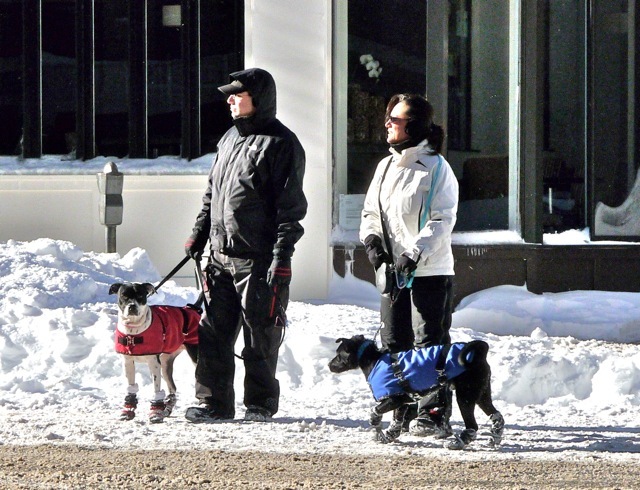 These two dogs were warmly and fashionably dressed in coats and booties. They were absolutely comfortable in the cold windy weather. This woman was almost as well dressed as the dogs. 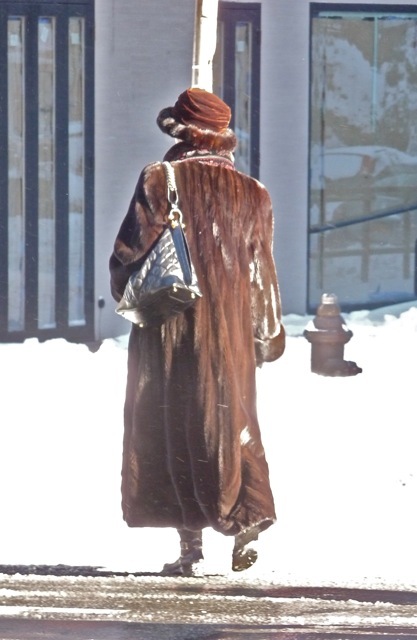 She was covered in a mink coat and a fur hat. She probably loathed to leave the cold and get indoors. 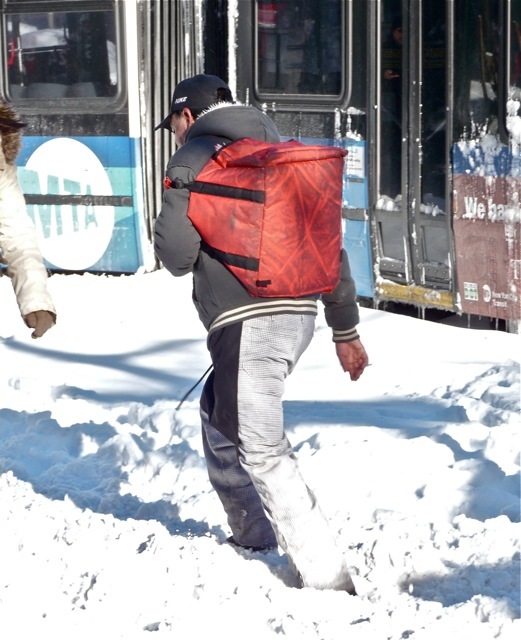 The most active people in the city were the food delivery men. They rode on bicycles. Contrary to the cliche of New Yorkers being cold and distant, I observed a demonstration of good human nature in difficult situations. 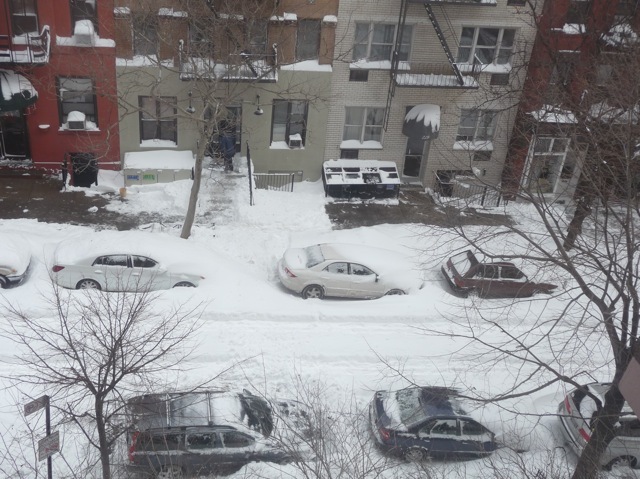 A woman drove her car on our unplowed street and her car was mired in the snow. 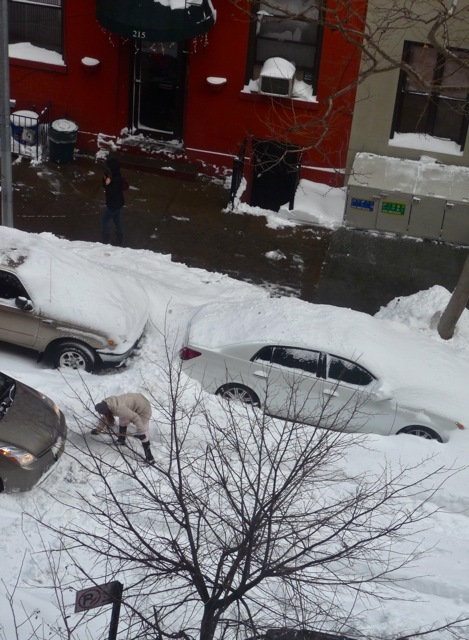 She got out of her car and shoveled snow to free her car. 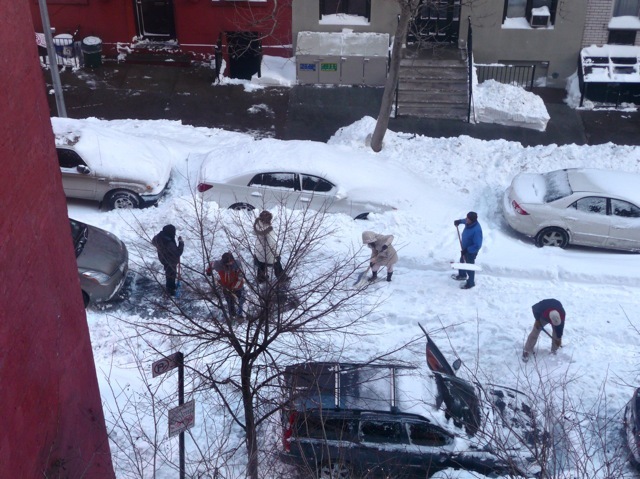 Soon, several neighbors chipped in with shovels and help her dig her car out of the snow. 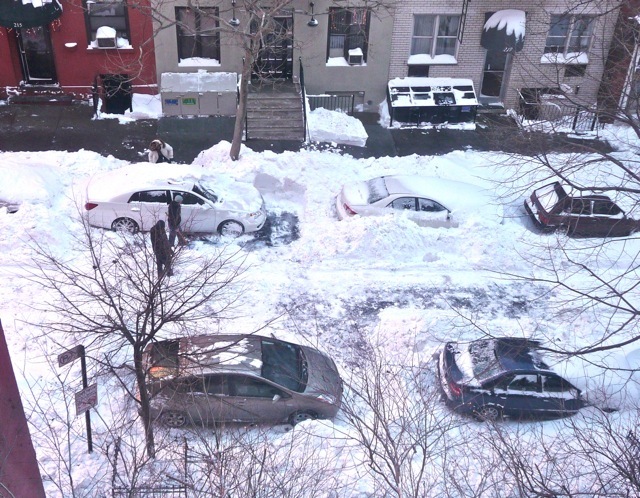 After an hour of digging, it became obvious her car would not be suitable to drive on snow-covered streets. The neighbors pushed her car into a vacant parking spot. This little episode reinforces my trust that people are generally good natured and helpful to others in need. Posted by Robert Wu on Monday, December 27, 2010, at 4:44 pm. Filed under Uncategorized. Follow any responses to this post with its comments RSS feed. You can post a comment or trackback from your blog.